You can be an employer, but with the help of Commonwealth, you can be the employest! The reality for the person at your company doing regular payroll runs, managing HR, and administering your benefits plan, quite frankly, is that it’s an inefficient, disjointed process that doesn’t allow for effective business decision making. Spreadsheets rule their day, which is a detriment to your business because spreadsheets can be cumbersome to manage and are often outdated sources of information. The status quo for employers just isn’t good. What if payroll, HR information, time and attendance, and benefits information were combined? It would mean a revolution for your business planning and processes. Business owners could make better leadership and profit-driving decisions from real-time, comprehensive data. 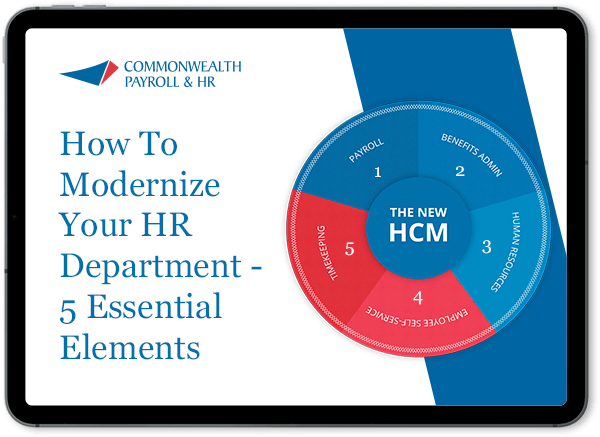 HR could initiate powerful employee annual reviews and eliminate payroll headaches. Employees could perform administrative tasks using employee self- service tools, saving HR and Payroll time, money and hassle while providing continually updated information. Finance could better understand the true cost of the company’s workforce, could better manage risk, and could easily manage ACA compliance. The solution is iSolved, a single, integrated database solution. This is what the employest companies can do! Combined reporting of payroll, HR information, and benefits is infinitely more powerful and useful to Human Capital Management teams. At any time, a glance at the Executive Dashboard, a real-time statistics tool, will provide your company’s leaders with the information most important to them. And everything is fully customizable to your business or industry. Behind that, a robust database provides easy access to meaningful reports when more detail is required. In tandem, employees can be given access to their own portals so that they can access view information about hours worked and vacation accrued, benefits options and elections, and documents like W-2 and pay stubs. This is just the beginning of what iSolved can do you for your business. Let us tell you more.